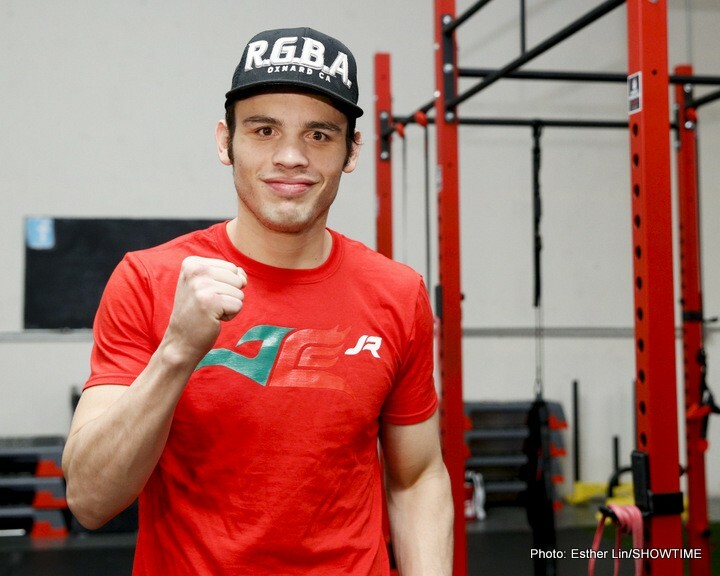 Julio Cesar Chavez Jr. will be looking to get back to winning again when he faces Alfredo Angulo (24-6, 20 KOs) next month on January 26 at a still to be determine venue in the U.S.
Chavez Jr. vs. Angulo was supposed to take place in December, but there wasn’t an available fight date for the match to take place, so it’s been kicked to January 26. Chavez Jr. cannot afford to lose this fight if he wants to career afloat. Angulo, 35, is the ideal opponent for Chavez Jr. to beat if he can make the weight without draining himself. That’s a big if for Chavez Jr. He’s not shown the ability to make the 168-lb. limit since he moved up to that division 4 years ago. Chavez Jr. (50-3-1, 32 KOs) is especially in need for a win right now following his lackluster performance against Saul Canelo Alvarez last May. The 31-year-old Chavez Jr. was entirely outclassed by the younger, faster, stronger and unquestionably more talented Canelo in losing a 12 round unanimous decision by the scores 120-108, 120-108 and 120-108. The Canelo-Chavez Jr. fight took on the Cinco de Mayo holiday weekend, and it was televised on HBO pay-per-view. The fight generated a lot of revenue in terms of PPV buys, and there were many angry boxing fans afterwards. 2004 Olympian Angulo has struggled since 2011, losing to James Kirkland, Saul Alvarez, James De La Rosa and Freddy Hernandez. Angulo has lost 4 out of his last 6 fights since 2013, and he’s quickly become a journeyman. At this point it’s quite unlikely that Angulo will turn thing around to right his career. He’s still has good power in both hands, but the lack of hand speed is the major problem that prevents Angulo from being a top-level guy. He lacks the speed needed for him to compete at the highest levels of the super middleweight division. Angulo isn’t cut out for the 168-lb. division. He was a much better fighter when he was competing at 154. “I was very happy that they considered me, because Julio is the son of the great legend Julio César Chávez. We are also both Mexicans, born there, where we grew up,” said Angulo to wbcboxing.com. You can’t rule out Angulo winning this match. If Chavez Jr. comes into the fight weight drained like he clearly was for the Canelo fight last May, then Angulo will win the fight easily. Angulo has punching power in both hands, and he doesn’t struggle to make the 168-lb. weight class the way Chavez Jr. has. When Chavez Jr. has his weight right, he’s a good fighter, but years since he’s looked good inside the ring. The last time Chavez Jr. fought well was in his rematch with Brian Vera on March 1, 2014. Chavez Jr. has struggled since then in losing to Andrzej Fonfara and Canelo. Chavez Jr’s only wins in the last 3 years have come against Dominik Britsch and Marcos Reyes.